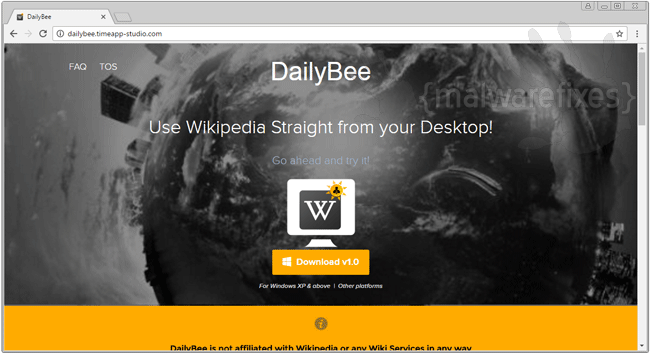 DailyBee is an ad-supported program promoted to help you access Wikipedia contents straight from your own desktop. This only means that it was tailored mainly to gain online profit. Normally, advertisements issued by DailyBee are usually targeted based on gathered data from computer users. DailyBee is an adware that can monitor your browsing habit such as web site you have visited, search queries, and anything that is relevant to your online interests. We have noticed that DailyBee can bring ads in various formats. Pop-up ads, contextual, redirects, or full-page materials are just some that can bother your online browsing. These ads can be as safe as other online ads if not only for cyber criminals that are utilizing this infamous scheme to spread malicious software. Thus, be cautious when clicking links from pop-up with labels “Ads by Daily Bee” or “Brought by Daily Bee”. Unwanted program can be complicated to remove due to various codes that was planted on the computer. Normal virus scan can remove DailyBee but it may resurface after a reboot. Getting rid of all the installed adware is the only solution to stop DailyBee from coming back. It is a widespread routine for adware makers to pack several potentially unwanted programs (PUP) into one installation file. Thus, when you install DailyBee, other adware also gets loaded in the background discretely. Even known and reputable software makers are into this bundling technique, however, they will present options when setting up the program. Always mind your safety when browsing the Internet to prevent adware like DailyBee from getting inside your PC. Download programs only from valid sources and official web sites. It is also important to have security software that is capable of blocking malicious file download and suspicious internet traffic. To totally get rid of DailyBee along with other adware, we have provided a simple guide on this page. Using various malware scanners is suggested to delete all hidden adware files that were dropped on various location of your computer. 3. Look for and remove DailyBee or Time App Studio entry. If not present, look for any suspicious labels that was installed recently. 4. It searches for presence of harmful programs, plug-ins, add-ons, or any data that were found malicious and linked to DailyBee. You need to Clean all items detected by this tool. After the previous scans, you may have deleted DailyBee from the affected browser. This next step will ensure that no more module of adware will be left on the browser. This free tool scans and checks the browser for unwanted add-on and extension, and if found, Avast Browser Cleanup will give you a report and suggestion. 4. Avast Browser Cleanup will confirm before it permanently deletes the add-on. Please click Yes to proceed with the removal of DailyBee on the affected browser. Cleaning your internet browser from clutter and unwanted add-on/extension is a must when dealing with DailyBee. The procedure below discuss on resetting various browsers to its default state. Resetting Google Chrome to default settings is helpful in deleting hard-to-remove extension such as from DailyBee. This method is highly advisable to perform if you have difficulty in removing unwanted extension. 2. In the address bar please type this string: chrome://settings/ and then, press Enter on keyboard. This function will reset your home page, new tab page, search engine, and other areas affected by DailyBee. Unwanted extensions will also be removed from the browser. This will not affect your bookmarks, history, and other saved data. You may also run Chrome Cleanup function from this page. An integrated tool from Google Chrome but with more advanced Adware scanner feature. This section describes how to remove unwanted extension from Firefox that may be related to DailyBee.. This process can fix many browser issues by restoring Firefox to factory settings without affecting your essential information (bookmarks, browsing history, passwords, and Internet cookies) on the browser. If you desire to remove only specific extension, please see manual removal of add-on from Firefox. 4. Firefox browser will close and start the resetting process. When done, it will display a list of restored data. DailyBee should be gone by now. Click Finish to open a fresh version of Firefox. Your data like favorites, bookmark, and history will remain in the browser. However, this process may delete add-ons by DailyBee and other unknown objects. If you prefer to carry out the procedure manually, please add-on removal from Internet Explorer.